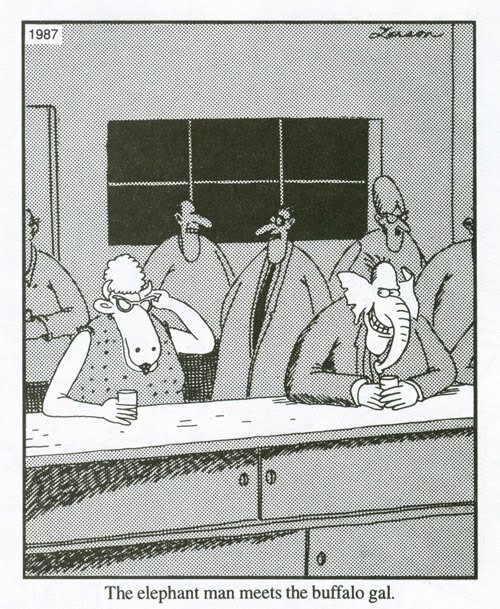 Back when I was a kid and I fanatically read The Far Side, my piano teacher had one of the retrospectives in which Gary Larson explains some of the nutso logic that led him to draw the comics he did. One Far Side, which I can’t find anywhere online, featured a meeting between two destined lovers, Elephant Man and Buffalo Gal, with the former referencing the famed deformocelebrity and the latter the woman from the folk song “Buffalo Gal, Won’t You Come Out Tonight?” Anyway, Larson just explained that the two names suggested that the characters would be compatible, in that weird Far Side way, thus the meeting of the two. Okay, okay, I know. It was the 90s. This is what we thought was funny back then. But I had reason to think of this comic last week at work, when various factors led me to verify a statement made by one of our columnists by looking up the Wikipedia page for Bram Stoker’s Dracula. That, of course, resulted in me looking up several other related pages, as that’s what Wikipedia was designed for. I ended up on the page for Lucy Westenra, the character whose encounter with Dracula ends rather badly. When I read Dracula in high school, I noted its odd use of the term “bloofer lady,” which children characters use to describe what is eventually revealed to be the vampire of Lucy, who stalks the countryside after her death and preys upon villagers. In the context of the story, I just assumed that “bloofer lady” was some regional British term for “boogeyman” to the point where that assumption sat, unattended and mostly useless in the back of my mind, as a sort of female counterpart for “boogeyman.” “Bloofer Lady, meet Boogeyman. You’ll hit it off, I think.” A nice matching pair, I think, not unlike Elephant Man and Buffalo Gal. Not the case, necessarily. People disagree on the subject, but the prevailing interpretation of the phrase is that “bloofer lady” is garbled childspeak for “beautiful lady.” Some annotated versions of the book postulate that, in any case. None of these being anything close to official sources, of course. None of the dictionaries I checked had anything to say about “bloofer,” one way or the other. And while most people who have anything to say on the subject side with the “beautiful” definition, they do so cautiously, often saying that people ultimately don’t know for sure. And seeing as how Stoker published Dracula in 1897, I feel like we won’t get any surer about “bloofer” in the years to come. I didn't even get past the first sentence in this blog post, before I realized we both had the same piano teacher. Ah. I guess it would make sense that we would have both had Mrs. Jones. 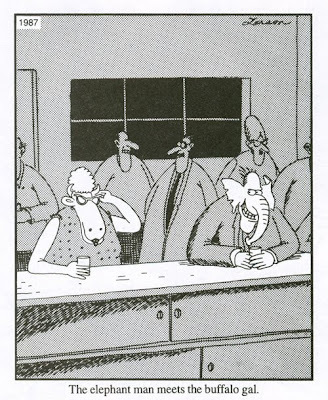 God, I loved those Far Side books. So much humor I didn't get at the time.